In the days before object-oriented programming (and even for a time after object-oriented programming became popular) there was a tendency to develop applications where the code for the user interface was tied tightly to the code containing the application logic and data handling. This coupling made application code difficult to maintain and locked the application to a single user interface. If, for example, an application written for Microsoft Windows needed to be migrated to Mac OS, all the code written specifically for the Windows UI toolkits had to be ripped out from amongst the data and logic code and replaced with the Mac OS equivalent. If the application then needed to be turned into a web based solution, the process would have to be repeated again. Attempts to achieve this feat were usually found to be prohibitively expensive and ultimately ended up with the applications being completely re-written each time a new platform needed to be targeted. The goal of the MVC design pattern is to divorce the logic and data handling code of an application from the presentation code. 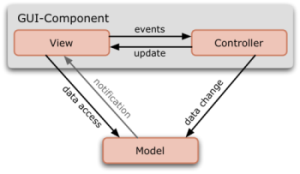 In this concept, the Model encapsulates the data for the application, the View presents and manages the user interface and the Controller provides the basic logic for the application and acts as the go-between, providing instructions to the Model based on user interactions with the View and updating the View to reflect responses from the Model. The true value of this approach is that the Model knows absolutely nothing about the presentation of the application. It just knows how to store and handle data and perform certain tasks when called upon by the Controller. Similarly, the View knows nothing about the data and logic model of the application. Within the context of an object-oriented programming environment such as the iOS SDK and Objective-C, the Model, View and Controller components are objects. It is also worth pointing out that applications are not restricted to a single model, view and controller. In fact, an app can consist of multiple view objects, controller objects and model objects. The way that a view controller object interacts with a Model is through the methods and properties exposed by that model object. This, in fact, is no different from the way one object interacts with another in any object-oriented programming environment. In terms of the view controller’s interactions with the view, however, things get a little more complicated. In practice, this is achieved using the Target-Action pattern, together with Outlets and Actions.